Finnish mobile phone manufacturer Nokia today presented the new member in the line of Lumia smartphones. The new device Lumia 625 is based on a large screen, but has a relatively low price. Analysts say that Nokia product strategy approaches to Samsung, which is trying to fill the market as soon as possible a large variety of smartphones. The new device Lumia 625 has 4.7 inches and costs 220 euros. For comparison, the previously submitted Lumia 620 has a 3.8-inch screen. Recall that just last week, the company revealed a new flagship Lumia smartphone-1020, equipped with a 41 megapixel camera. In a statement, the company said that the Nokia Lumia 625 smartphone embodies many of the innovations that have been recently presented in the Lumia 1020. Deliverables include a number of complex applications for the camera, such as Nokia Smart Camera, providing user-friendly features such as removing unwanted items from the frame, and Nokia Cinemagraph, turn photos into animated images by adding motion to still images. 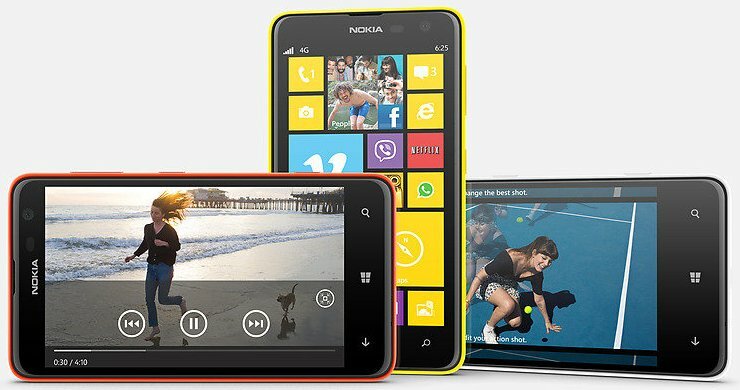 Lumia 625 runs on Windows Phone 8 and pack Nokia Lumia Amber. This update “Live Tiles” directly on the home screen and the app People Hub («Contact») makes it easy to stay connected with their friends and loved ones. In addition, in order to more convenience in everyday use in the operating system Windows Phone 8 provides a network service Xbox Live, integrated with Microsoft Office, and 7 GB of memory for storing data in the cloud storage SkyDrive. At the start of sales of Nokia Lumia 625 will be available in orange, white and black colors with a set of interchangeable panels, easily giving the device an individual character.